Double Dog Dare. Laugh-out-loud fun. Here at Hidden Staircase I enjoy all kinds of mysteries, especially a good cozy series. 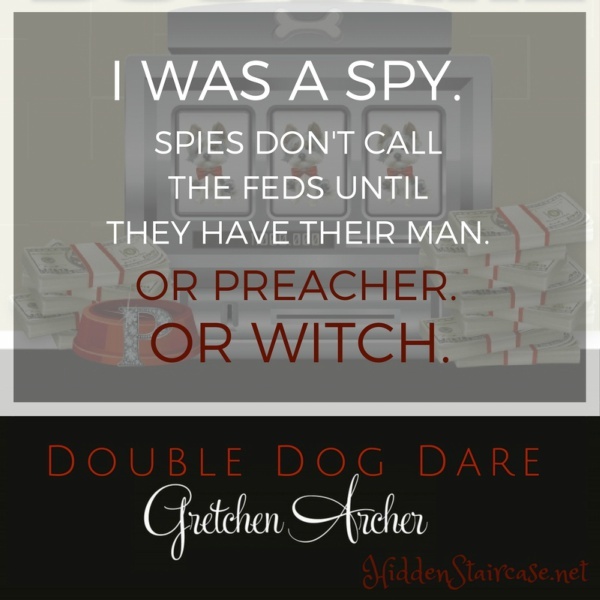 A few years ago I discovered Gretchen Archer’s Davis Way series, which quickly became a favorite. I know when I pick up a book in the Davis Way series I’m sure to forget my troubles for a while (Davis will have plenty), and I can settle in for a fun, laugh-out-loud adventure. Double Dog Dare (book seven) did not let me down. Davis has given up her hectic super-spy schedule and now works part-time Bellissimo Casino security from the comfort of home (on the 29th floor of the casino) in order to spend more time with her twin girls. We find Davis eager to spend the week with special visitors coming in for the Bellissimo’s dog show: her sister Meredith, Meredith’s best friend Vree, and Vree’s dog Bubblegum. But Meredith and Bubblegum don’t arrive at the Bellissimo. Instead, Davis and Vree are greeted by Bootsy Howard, who gives Davis one week to come up with one million dollars in exchange for her sister. And Bubblegum. Honestly this book is a roller coaster ride from here. Kidnapping, murder, possible witchcraft, a missing body, and more dogs than Davis knows what to do with. Not to mention, she still needs to keep up with her security duties that her boss No Hair assigns, and fill in for Bianca as a judge in the dog show. She’s got her hands full. Luckily, her husband Bradley is out of town (he would want to bring in the proper authorities), and her best friend Fantasy is around to help Davis get to the bottom of things. My favorite part of these books is always Ms. Archer’s writing style. She writes in the first person, and Davis’ view (and her asides) are always just so darn funny. I did miss some of the characters we’ve met in previous outings, but the new characters introduced keep the series fresh and fun. 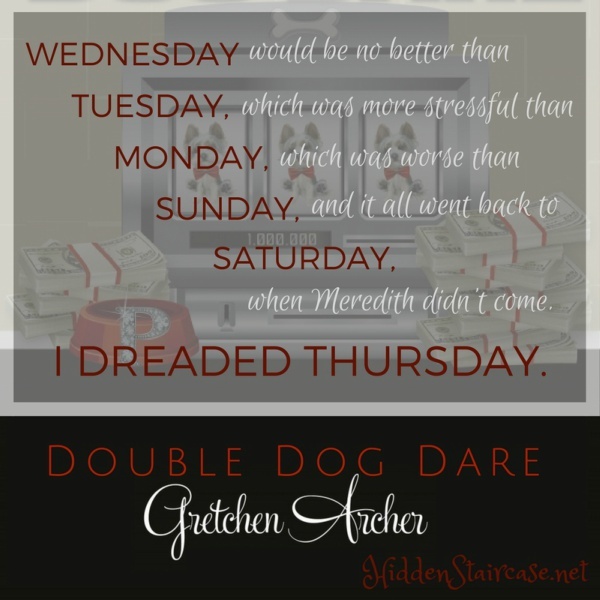 The story took unexpected turns and Double Dog Dare kept me laughing out loud and frantically turning pages to see what was going to happen next. While I do recommend reading previous books in this series just because they are so darn funny, new readers can feel free to start here and not be lost. 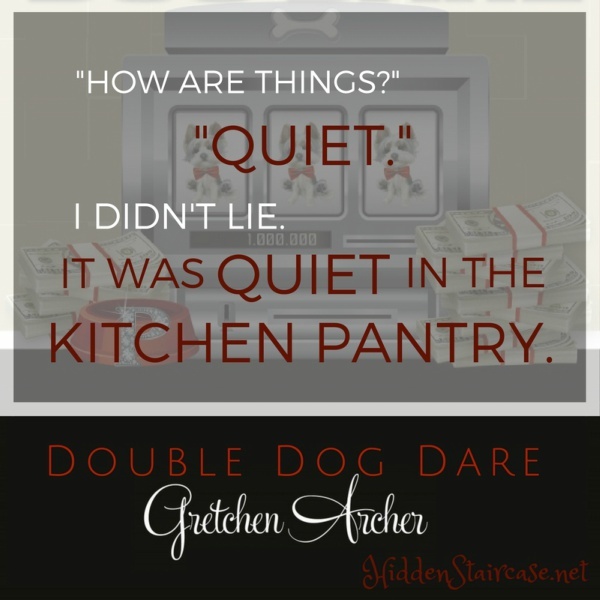 Double Dog Dare is fast paced, with plenty of surprises thrown in. And, as always, everything manages to tie together for a satisfying ending. 2018 Reading Challenge: A book with alliteration in the title. ← Music Monday. Even Better Than the Original: Blank Space. And that ability to tie it all together is no small matter. i can’t even count the number of books I read where at the end, I look up and say — “But what happened to … ” the answer being (I guess) the author forgot who couldn’t fit it in or it really didn’t matter (then why was it there in the first place?) … It is a rare and skilled author who doesn’t drop meaningless clues and knows how to make it all come together.